Deendayal Port Trust (DPT) Recruitment 2018 Job alert both Fresher and Experienced can get DPT recruitment 2018 updated on January 11, 2018 notification on recent DPT recruitment 2018 openings across India. This is an exclusive page updated on 11.01.2018 for the latest recruitment notification kandlaport.gov.in from Deendayal Port Trust (DPT) 2018 it contains both active and recently expired Job openings and recruitment notification from DPT 2018. (ii) Nine years experience in executive cadre in the field of General Administration, Personnel, Industrial Relations etc. in an Industrial / Commercial / Govt. Undertaking. Experience: Five years experience in executive cadre in the field of Finance, Accounting in an Industrial / Commercial / Govt. Undertaking. 1. Attested copies of ACRs of the applicants for the last 5 years. 3. 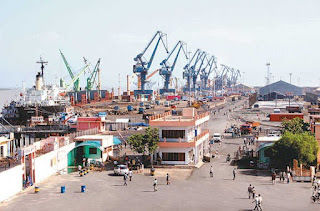 No- Objection Certificates of respective Ports. 5. Vigilance / Administrative clearance of the concerned Port in the Proforma (Annexure-IV) . Deendayal Port Trust has been Published Recruitment Notification for Executive Engineer Post 2018. Other Details Like Age Limit, Educational Qualification, Selection Process, Application Fee and How to Apply are given below. Deendayal Port Trust Recruitment 2018 Job alert both Fresher and Experienced can get Kandla Port Trust recruitment 2018 updated on January 8, 2018 notification on recent Kandla Port Trust recruitment 2018 openings across India. This is an exclusive page updated on 08.01.2018 for the latest recruitment notification kandlaport.gov.in from Deendayal Port Trust 2018 it contains both active and recently expired Job openings and recruitment notification from Deendayal Port Trust 2018. The names of the eligible and willing officers, who satisfy the provisions of recruitment rule for the above mentioned post, may be forwarded together with their applications in the prescribed format, alongwith the following documents to this office on or before 18_/01 /2018 :- 1. Attested copies of ACRs of the applicant for the last 5 years. 2. Attested copies of all certificates. 3. No Objection Certificate of respective Port. 4. An undertaking of the applicant not to withdraw, if selected. 5. Vigilance / Administrative clearance of the concerned Port in the Proforma prescribed by the Ministry . 3. The applications received through proper channel only will be entertained. The applications received after the last date or without ACRs or otherwise incomplete will not be considered.